The concept of hospice began in England as a place where people could go to be comforted while dying from an illness. The origin of the word “hospice” in medieval times meant “way station for weary travelers”. The word retains its original meaning when viewed from the standpoint that we are all sojourners on this planet. Today, hospices are state-regulated and only accept patients who have less than six months to live. It is a philosophy of care that may be provided in the patient’s home or in a hospice facility. For many years people viewed death as a normal part of existence, and it was not uncommon for people to die at home. In fact, the whole process of caring for the loved one before, during and after death was something families did at home. It wasn’t until the past 50 or so years that it became common for people to die in hospitals and hospices, and for funeral homes to provide after-death care for the body. Almost everyone I interviewed for this book told me that they sensed the presence of their loved ones near them during the funeral, graveside ceremony and in the days following. In one of my lunchtime drives through the cemetery, I came upon a fresh grave and felt compelled to stop. As I sat there eating my lunch, I became aware of a presence in the back seat of my car so I started a conversation with what felt like a male energy. I nodded toward the mound of red dirt and asked him if that was where they put his body. He affirmed that it was. I asked him why he was still hanging around in the cemetery. He replied, “Where am I supposed to go?” I told him to go to the Light, but he said he was afraid to because he hadn't lived a very good life. I told him that God loves him no matter what kind of life he lived. Then, I asked the angels to come and assist him in finding his place in the Afterlife. I heard him thank me as he was whooshed upward through the roof on the passenger side of my car. Let’s talk for a minute about treatments available for the remains of a body. Some people believe that embalming or cremation is necessary or required by law, but neither is true. Embalming is done to preserve the body and make it cosmetically presentable for an open-casket viewing. If a body is being shipped via common carrier, it must be embalmed or placed into an acceptable container. Only a few states require embalming, and if cremation is chosen, embalming is not necessary. Embalming and mummification, (wrapping the washed corpse with cloth after application of oils and spices), began in Egypt and was the custom for religious and sanitation purposes. Egyptians believed that a soul could return to its body after a "circle of necessity" as long as the body remained in tact. The circle of necessity was a 3,000 year journey of the soul, after which it could re-inhabit the body and arise to live with the gods. Prior to the discovery of embalming, the Egyptians buried their dead in the Nile River. Ethiopians, Babylonians, Persians, Syrians, and Aboriginal inhabitants of the Canary Islands practiced mummification of their dead. Early Jewish and Islamic customs did not allow embalming or cremation because they saw it as mutilation or desecration of the body. Muslim practices today are similar to mummification, except the body is laid to rest in the ground without a coffin, generally with the deceased’s head facing towards Mecca. There is no evidence that Early Christians practiced embalming. Embalming was used in the Dark Ages in Europe when great advances were being made in medicine and bodies were needed for scientific study and dissection purposes. More than likely, each of us has a memory about the passing of a loved one. By sharing these inspiring stories we realize that after death our loved ones are still connected with us in spirit. We discover our own strength as we care for one another in difficult times. We learn more about our friends and families and bond with them in a way that perhaps couldn’t be expressed before. Certainly, if you’ve ever been with someone as they passed, you know that the experience itself can change your life. Why not talk about these precious memories with someone today? Do I Have Spirit Guides? The most popular spirit guide for Christians is Jesus. The most common guide for Catholics is Mother Mary. Our views of death may have changed over the years, but one thing remains certain: we all need and want genuine, unconditional love. It touches and heals our soul, strengthens our spirit and enriches our lives. Birth and death, (entrance and exit from Earth), are two events where unconditional love is especially important. If you knew you only had a few weeks to live what conditions would you want around you? Would you prefer to be at home in familiar surroundings, or in a hospital or hospice center with access to medical professionals and trained volunteers to comfort you while you wait for your departure? Would you want your pastor or a member from your church to be with you as you make your exit? I would rather have a friend or family member with me, but perhaps you would prefer to die alone. In an article from Dyingwell.org titled "Spiritual Care at the End of Life," statistics were given from a 1997 Gallup survey, Spiritual Beliefs and the Dying Process. The survey suggested that people who are dying want contact with someone they can share their fears and concerns with. Many wanted someone to touch them or hold their hand. About half want someone to pray with them and help them find spiritual peace. Many who are dying want their spouse, children, immediate family members or close friends nearby. Even though many of the people surveyed considered themselves part of the religious community of faith, very few actually wanted a member of clergy to be with them in their last days. A person who is unable to control his bodily functions or feed himself is probably not going to find much comfort in the pastor or church member sent to “make the rounds to visit the sick and elderly”. Just as the birth of a baby deserves a celebration, so does the death of a loved one. It is a celebration of the life he or she lived, and it allows friends of the deceased to pay their last respects and offer condolences to the family. My husband has planned his own funeral. To save money he wants to be cremated in the backyard fire pit and his ashes used to fertilize our garden. He has asked me to throw a party in his honor. Everyone should bring their own six pack of beer or a bottle of tequila, some party favors and a lot of food that I can freeze so I won’t have to cook for a while (Randy is the family chef, not me!) There will be dancing to 60s and 70s Rock-n-Roll classics, and our sons have been instructed to set off a huge display of fireworks in the cul-de-sac after dark. The media and the fire department will be notified in advance. When my husband’s father passed away, our family did not entertain grief or sorrow in a public setting. Instead we entertained guests and celebrated the life Rumsey had lived. As an alternative to a graveside service, we had dinner in the fellowship hall of the church where everyone told stories and shared memories of how much their lives had been blessed by knowing him. People were laughing, eating and enjoying the camaraderie in the midst of what some would consider a very sad event. So many times I’ve been to funerals and graveside services where I just didn’t know what to say or how to comfort the grieving family. At Rumsey’s service, we made sure everyone understood that this was a celebration of Rumsey’s LIFE, not a time for grieving his death. It was the best party the family ever had! As he had requested, Rumsey’s body was cremated and his ashes were buried by a tree in the yard near a bench where his wife, Marlene, could sit and reflect when she missed him. To help our kids understand that Papa was still nearby, we told them that anytime they missed him they could go outside, look up at the sky, find the brightest star and know that he was near. It is not easy to address issues of death and dying with your family members, but the time of crisis is not the best time to discuss end of life procedures. It is a blessing to know in advance what your loved one wants and the only way to find out is to ask while they are able to tell you. It may be one of the best and most meaningful conversations you ever have. Plan a family meeting and make it a fun and intimate event. It would be an excellent time to sign your Advanced Directive or Living Will (see Appendix A). If you are unsure about what you want or if you need more information about available procedures please talk with a doctor or healthcare provider. When did the practice of embalming begin? In the United States, Modern embalming started during the Civil War when President Lincoln directed the Quartermaster Corps to use embalming when returning bodies to their home towns for proper burial. Dr. Thomas Holmes, captain in the Army Medical Corps, embalmed over 4,000 soldiers and officers during the war. Realizing the commercial potential, Holmes resigned his commission and began offering embalming to the public for $100. However, the practice did not become common until the turn of the century. It was then that a person, who would undertake to manage all funeral details and provide funeral merchandise, became known as an "undertaker." Funeral services became a business that attracted representatives from embalming fluid companies. These representatives would travel the country selling embalming fluids (mostly formaldehyde) and teaching about the use of their product. Embalming gave ample time to arrange and prepare for the funeral and has therefore remained an acceptable and desirable method of post-mortem treatment in the United States and Canada. Embalming forms the foundation for funeral service business; but according to the U.S. Centers for Disease Control, it offers no public health benefit. Occupational Safety and Health Administration (OSHA) requires embalmers to wear a respirator and full-body covering while embalming; however, the release of contaminated blood and highly toxic chemicals used in the process are not regulated by any governmental agency and are commonly dumped into our sewer systems. Hawaii and Ontario forbid embalming if the person died of certain contagious diseases. Embalming is an expensive and physically invasive process in which special devices are implanted, and chemicals and dyes are used to give a restful appearance. While it prevents the body from returning to its natural elements quickly and naturally, it does not postpone decomposition indefinitely. Refrigeration will effectively maintain a body while awaiting a public funeral service or private home viewing by family members and close friends. While not all funeral homes have refrigeration facilities, most hospitals do. Many funeral directors will not allow public viewing of a body without embalming and cosmetic restoration because they consider seeing "a beautiful memory picture," as it's called in the trade, a necessary part of the grieving process. Yet, many people consider viewing a dead body a negative experience. According to the personal opinion of author, Elisabeth Kubler-Ross, in her book, Questions and Answers on Death and Dying, it may give the illusion that the deceased is only asleep which may actually prolong the stage of denial. Many people in nursing homes and hospice care are without the loving presence and spiritual support of friends or family. There is a great need for compassionate volunteers, but not everyone is up to the task of assisting people in their transition. It takes a special person to walk in, meet someone for the first time, talk intimately with them, and hold their hand, all the while knowing they may not be around the next time they come to visit. Yet, this blessed gift of friendship is crucial in helping a soul leave peacefully. You've probably heard of people losing their will to live, but I wonder how much a person's will actually has upon whether he or she lives or dies. When my friend's grandfather passed, my friend's grandmother was in pretty good health. When her soul mate died, she lost her will to live, and she passed within one year of his death. When my uncle was in hospice, he stayed in his body for nearly a year after the doctors thought he should have died. He had no quality of life. He would rally and then fall back over and over as his body continued to decline. Finally, he went into a coma and was passed. I believe the reason his body did not die sooner was because my family was praying and pulling for him to get well. It seemed to me that their collective energy had just enough power to impact his will to live. When my grandmother fell, I felt strongly that her soul was intending to reach the other side before losing another child through death. If you've been following this blog, you know that my aunt has terminal lung cancer. My grandmother pulled through her hip surgery and is recovering at home, but she will never be able to walk again. Being totally dependent upon another person was something she never wanted. She has been active all her life, and this is quite an adjustment for her. Have you seen someone die because he or she lost the will to live? Have you seen someone live against all odds because he or she had a strong will to live? Do you believe prayer or another person's will can influence the continuation or ending of someone whose life is hanging in the balance? I'd like your feedback. Please share your insight or experience with us by leaving a comment on this blog. Look for the "comment" feature below this post. Today, I am sharing my interview that I conducted with the authors of a book about a walk-out named Laila. The Legacy of the Chosen One is not for everyone, but more people are probably experiencing or know someone who is or has experienced the phenomenon of soul exchange, walk-ins, and walk-outs than they realize. I wrote about my own experience in my book More Than Meets the Eye. When the soul that incarnated in this body walked out in 1999, I had no clue what had happened or why I suddenly felt so different or why my life changed so drastically starting the very next day. Within a month, everything in my life had changed and it was tragic at the time—much better than ever at this point, but nevertheless very painful then. It was almost like dealing Post-traumatic Stress Disorder because the first soul left a lot of things undone. She was on the verge of destroying the body because she was so ready to leave for the Spirit World, but it was not time. My walking in was a rescue mission to keep the first soul from harming the body so we could maintain our agreement that we had arranged before this body was created. I had to heal her broken relationships and resolve the karma she had left before I could get on with my own mission. I felt detached from those I knew and loved most. My friends and family kept saying how much I had changed. I knew I had because I thought and acted differently, and felt a different energy around me. I needed an explanation, but I found very few books or information on the topic. I found some information online by coincidence (if you believe in such a thing) that helped me find peace about the situation, once I accepted what had happened. Now, there is a book that truly explains the process. The Legacy of the Chosen One by Ray Brennan and Masomeh Fritz is available to help people understand why NDEs and soul exchanges are becoming more common. Those who are thinking of suicide may want to explore this alternative and non-destructive way of leaving the planet. One night in December, during an emotionally heated argument with my husband, (we had never before expressed anger toward one another), I fell to the floor unconscious. I was out of body and could not respond to my husband or my daughter as they attempted to rouse me. I could hear them speak, but I couldn’t talk or will my body to move. I felt paralyzed. I knew that something spiritual was taking place. When I regained consciousness, I felt really strange. I didn’t feel like I was the same person. I was physically drained and weak, but I had courage and a resolve that I didn’t have before. That night, I slept in my son’s old room, calm and in control of my emotions. I got up at six o’clock the next morning, packed my bags and walked out on a 21-year marriage. As I went through the divorce and attempted to get on my feet financially, I felt like I was walking through a fog. I felt disconnected to everyone and everything. I tried to pray, but found that I could no longer intercede with the fervor and intensity that I had before. I had a difficult time trying to form words and make sentences because I couldn’t think straight. I thought it was just the stress and trauma of all I was going through. Maybe my nerves were shot, but why then, did I feel such a strength and deep knowing that everything was happening exactly as it was supposed to? I felt like I was being carried along by a current more powerful than my own strength. I just didn’t feel like my old self and my own family seemed like strangers to me. I remember wondering if I had died and came back as someone else! What I didn’t know until almost five years later, was that a new soul HAD walked into my body that night and took charge. This experience is called a “walk-in” or soul exchange. I had never heard of such a thing until I heard a lady sharing her walk-in experience. As she was talking, my body jerked and shuddered, and I felt a sense of "knowing" hit solid in my gut. The light bulb when on, and I knew that was what had happened to me. Later, I tried to talk myself out of believing something so weird, but I couldn’t help but ponder the probability that I might be living as a walk-in soul. I certainly didn’t mention it to anyone who could have me committed to a mental institution! It sounds strange, I know. I didn’t understand the phenomenon at first either, but if you think about it, the concept makes sense. One soul is ready to leave a healthy adult body for whatever reason, and another soul is ready to enter the earth plane. The new soul may begin its spiritual growth and planetary mission immediately without having to go through the infant and childhood stages of development. Sometimes, the new soul is simply another part of the hologram of the original soul that vibrates at a higher frequency and has a more intense mission. The new soul will have to make adjustments to being in a body, and deal with the first soul’s old issues, as well as heal its wounds and resolve its karma. That is no easy task, but it is still much better than wasting a body through suicide! Had this experience not made such a huge and sudden impact on me, I wouldn’t have believed it was possible. Many aspects of my personality, interests, career and relationships changed drastically. For example, I was a musician who practiced as much as five hours a day before the episode. Afterward, I rarely touched the piano. Within one year I had completely changed my spiritual beliefs, divorced my first husband, married my present husband, started a new job that led me to begin my writing career. I have very few childhood memories, and the memories I do have are like watching myself on video or seeing myself in a photo, rather than as the one doing the action. These are common indications that a walk-in has occurred. I interviewed Ray Brennan and Masomeh Fritz, the authors of a book about walk-ins titled The Legacy of the Chosen One. Ray and Masomeh are well-known in the field of metaphysical spirituality, with decades of experience between them. They also have a wealth of experience providing metaphysical workshops and lectures. Ray has been instructing for 27 years. I would like to share this interview with you in tomorrow's post. There is growing acceptance of the concept that life continues after death. In the book, Hello from Heaven, Bill and Judy Guggenheim state that as many as 67 percent of bereaved individuals report experiencing after death communications from their loved ones. Do you believe in an afterlife? Comment below this post and give us your answer. Feel free to say why you do or do not believe in it. How many kids know their great-grandparent's name? Not many, but even fewer know the name of their great-great-grandparent. My seven-year-old grandson lives in Tennessee. Whenever he has a break from school, he calls his great-grandmother in Atlanta to come and pick him up so he can spend time with her, my dad, and my grandmother, who lives with them. That means Sidney not only knows about his great-great-grandmother, he personally knows her and enjoys her company. We are blessed to have all five generations represented at Thanksgiving this year. Especially, after the matriarch (we call her Nanny) fell and broke her hip and arm and had surgery this first part of November. There are five generations represented in this photo of my family. This was taken at my daughter's wedding in 2007. On the upper row, from left to right: my mom, me, my daughter. On the lower row: my grandson (my son's boy) and Nanny, my grandmother (my mom's mother). The reason I love the CBS show The Ghost Whisperer so much is that I finally found a show that demonstrates someone who has experiences similar to mine, and with the show being so popular, I no longer felt like such an odd-ball when I speak about it. Spirit communication has been a normal part of my life for many years. Just last month, I had a visitor in my office who came along with a book that was delivered by UPS. I had edited the book for a client and it was about his father who had deceased and about his brother who committed suicide at age 16. It was the brother's spirit who accompanied the book. I sensed his presence the moment I touched the box and he asked if he could stay and observe for a while. (Spirits do that sometimes) I told him it was okay to stay and observe as long as he didn't pull any tricks with me. But, being the playful soul that he is, he couldn't resist! I was sitting in my office when all of a sudden POP! It sounded like a cap gun went off in the corner of the room. (I heard it with my own ears, not just in my head) Remember those red rolls/strips of caps that kids put in a metal gun? We used to pop them with a hammer. I knew it was this spirit playing games (normal for him per the book) and told him he had to leave because I wasn't putting up with being startled while I'm working. He left, but I thought is was funny afterward. I've awakened in the night to see souls standing over my bed just looking at me. I'm like "What? Can't a girl sleep?" I've had spirits move stuff around in my house. They have broken stuff, thrown boots down from the top of my closet, hidden objects only to be found later exactly where I left them, etc. Last week's episode of The Ghost Whisperer was about a walk-in or soul exchange. While the show has a bit of "Hollywood" or sensationalism to make it entertaining, its content is based on very true spiritual experiences. In the episode that aired November 21, Jim has died, but refuses to leave Melinda and go into the Light. Instead, he "walks in" to the body of someone who has just died. Melinda knows what has happened and spends the entire show trying to convince others and keep Jim from leaving her as he takes on the life of the man whose body he now occupies. I feel like Melinda Gordon sometimes. I got a message from a friend who passed last December. He wanted me to write his mom and let her know that he is with someone or possibly a pet named Mason. I have no idea whether or not they will accept my message and I certainly don't want to upset them, but he was bothering the heck out of me about getting in touch with them. I sat on this information since last summer. So, today I wrote a letter and plan to mail it tomorrow. I hope they don't think I'm insane or harassing them. Nanny had to be taken back to the hospital on Thursday because her oxygen level was low and the doctor could not prescribe oxygen for in-home use without seeing the patient, so Mom had to call an ambulance to transport Nanny back to the hospital. The first x-ray revealed pneumonia in her left lung so she is on antibiotic for that, but she also has an infection in her blood. I don't know what that means. The MRI of her stomach and abdomen did not show where the infection in her blood is coming from. They will do another test in the morning. Thankfully, my uncle is taking two 24-hour shifts at the hospital to stay with Nanny this week to let my mom rest and get some of her pies made for Thanksgiving. Mom plans to have everyone over regardless of the situation. We tried to talk her into canceling it this year, but she wouldn't hear of it. She has extra help lined up for Tuesday and Wednesday. The surgeon took a look at Nanny's second x-ray today and said the surgery to repair Nanny's hip did not "take" as he had hoped. It will not heal in a manner that will allow it to support her weight and function correctly. The option is a total hip replacement surgery but he didn't think she was strong enough for it since she had just come through surgery, has an infection, a blood clotting disorder, a touch of emphysema, and pneumonia. Even if they could do the surgery, there would be no guarantee that it would hold and heal properly due to her advanced stage of osteoporosis. The sad truth is that she will never be able to walk again. That does not mean she can't live a quality life, she just won't be able to go on her weekly trips to the grocery store, Sam's Club, and the Wal-Mart because she can't get in and out of the car. It is sad to see her unable to care for herself and others as she has always done. On a good note, she is supposed to go home tomorrow (Sunday) if everything checks out okay with her bladder. The healthcare company has delivered a hoist to my parent's home so they can get her in and out of bed without hurting their backs. We have to care for the caregiver. We certainly can't have Mom being out of commission. At least Nanny will be able to get up and sit in a wheelchair. Her arm is healing nicely. Nanny did not get to go home from the hospital today but hopefully she will tomorrow. She says I visited her in spirit this morning. That's possible. I had a visitation from her son, my uncle Edmond early this morning. He is waiting for her on the Other Side. Nanny is at home now. Mom and I swap nights keeping the baby monitor in our room to listen for Nanny. That way we get a good night's rest every other day. I know Mom needs my help, but after spending almost a week away, I've got to get back home this weekend while I have a ride. I hate to leave Mom with this situation to deal with, but I need to tend to my writing business. I'll be back for Thanksgiving less than two weeks away. I've reconnected with my aunt Kathryn (Kat as we call her) while I've been here. She is ready for her transtition to the Afterlife. I didn't know she was so spiritually open until we started talking about the CBS show the Ghost Whisperer. We both love that show, but somehow missed the Friday night episode while caring for Nanny. Kat and I found the episode online and watched it. Afterward, I told her that when she got to the Other Side, she'd better not throw apples, forks, or dishes at me, but that I do want her to let me know how she is doing. We will come up with a sign or symbol to give that message. I'm back at home in Nashville where I've been catching up on my work. I had over 1,000 emails to answer and client work to to respond to. I've kept in touch with my aunt Kat by email nearly everyday since leaving GA. It tires her to talk so I don't call her on the phone. We've decided that a cameo or silhouette will be our sign when she reaches the afterlife. I fully expect to see some indication that she is trying to communicate with me. Who knows how long she will be with us? Unlike when my grandfather was ill, this time I will not pull away in fear. I will face this boldly and be of whatever service I can to the one who is passing. The doctor says Kat has six to eight months left to live. Who knows? Cancer can't be put on our time schedule. She could have years or maybe only days. We will all pass at some time or another. Nanny may go before Kat. I could go before either of them. We can't pretend that there isn't an elephant in our living room. I know it is a sensitive issue, but I'm not afraid to talk about it. Kat sure seems to appreciate someone to talk with openly. We even laugh about it at time. I forgot how much I loved her. We were close when I was a teenager. It is so nice to be in touch with her again. Nanny was doing great yesterday and her doctor spoke of her going home in a couple of days. Today, her blood platelet count is low and they don't know why. They took her to have an ultrasound to check her spleen and other organs for internal bleeding. Her blood sugar has also been elevated since she arrived so they want to make sure her pancreas is okay. She is talking out of her head today even though she hasn’t had any narcotics for pain. They tell us it is normal for an elderly person to respond like that after surgery. The physical therapist came by and helped Nanny get into a chair this morning. She was actually able to bear weight on her left leg long enough to stand up while transitioning. She is doing small foot and leg movements/exercises to preserve muscle tone while recovering. Nanny is in very good spirits and her mind is alert. We will be taking her home in a couple of days where she will have therapists and an aide coming three times a week to assist. Nanny lives with my parents and we do plan to bring her home. We promised her years ago that we would never place her in a facility where we could not be with her around the clock. Mom has two sisters and one brother living. One sister has terminal cancer and is in hospice at home, so we are also caring for her. My dad has diabetes so he has to be looked after too. Nanny will be transported home via ambulance. Surgery went well. She'll be in recovery unit until about 9 p.m. then returned to a private room. The surgeon told us he had it fixed to heal properly. However, we were told that she will be using a wheelchair for months (possibly from now on). I offered to stay at the hospital with Nanny so my mom could go home and rest. Mom says she's afraid I can't handle it if Nanny were to pass during my watch. I assured her that Nanny and I have both been to the Other Side and back and that we have an understanding rather than a fear of such things. Nanny is resting in her room now, but she was freaking out when she first came back because she thought she was in a nursing home. When she heard MawMaw's (my mom) voice, she calmed down and her BP went into normal range. There was no way Mom would leave her there alone tonight so I came back to the house to rest up. That way I'll be fresh to let Mom come home and rest tomorrow when Nanny is more coherent. The nurses have been very attentive to her and I feel confident that they will make sure Mom and Nanny have all they need throughout the night. They had brought clear liquids and were helping her sip through a straw when I was leaving. So, all in all, things are going well. By the way, It's her right side that was injured. As you know from yesterday's post, my grandmother, who lives with my parents, fell in the kitchen and broke her hip and arm on Friday, November 7. I headed for Atlanta that same day. At 92 and facing surgery, I wasn’t sure I would see Nanny alive again, but as it turned out, she did fine with the surgery to repair her hip. She was released the following Wednesday and I continued to stay to help my mom care for her mom. Nanny went back into the hospital by ambulance the following Wednesday because her oxygen level was low. An x-ray revealed pneumonia in her left lung. I think she is ready to depart for the spirit world so she will be there when her daughter, Kathryn, arrives. My aunt, “Kat” as we call her, is in hospice care for terminal cancer. However, both of these strong-bodied and determined women are doing well at the moment, for which I am very thankful. I hate for anyone to suffer. You might think all this trauma would make us sad, but the truth is my family does not view death as a tragic thing. Dying is as natural as being born because both are part of the never-ending life cycle. With my grandmother having five kids who produced twelve grandkids, twenty-seven great-grandkids, ten great-great-grandkids and two more on the way, it doesn’t take long to fill the house on any given holiday. Any time my folks get together, there is going to be a lot of love and laughter. In fact, we had a dorm party in the hospital room while awaiting Nanny to return from surgery. Starbuck's coffee was used as a replacement for the keg of beer typically used in a college dorm party. I dearly love my aunt Kat. She and I have agreed upon a sign that she will give me to let me know what it’s like for her once she reaches the other side. I fully expect she will visit me. My other "deceased" (that word really doesn't mean "dead"; it just means they are no longer in a human body) family members have. When sleeping in Nanny’s bed while she was at the hospital, I sensed a spirit presence in her bedroom. Since Nanny and I have both communicated several times with Pap (her husband) and Edmond (her son) after they passed, I expected the presence was probably one of them. BAM! The picture that was hanging over the bed where I was resting slid down the wall and stood upright behind the bed. “I’ll take that as a yes. I suppose you want to know why I’m in Nanny’s bed?” I explained to him what had happened and his presence immediately left. I figured he went to look for her at Northside Hospital. I hope he knows about the new branch that has been built at Forsythe county since he departed. I suppose souls have pretty good GPS. Over the next few posts, I’ll share some of the things that have transpired in the past few weeks or months as I deal with what seems to be a preparation for departure of my loved ones from their physical bodies. My grandmother turned 92 last July. Two weeks ago (November 7) she fell in the kitchen in the home she shares with my parents. She broke her hip and arm, overcame surgery, and was released from the hospital in less than a week. She was doing well until her in-home nurse discovered that Nanny's oxygen level was low. Tanks could not be delivered without doctors prescription and the doctor could not prescribe it without seeing the patient, so back to the hospital (by ambulance) she went. X-ray revealed pneumonia in her left lung. She had an MRI today of her stomach and abdomen to see where the infection in her blood is coming from. My honest opinion is that her soul is ready to depart from her body and is looking for a way out. Why? Because she wants to be on the Other Side when my aunt Kat arrives. Kat is in hospice care for terminal lung cancer. It is only natural for the body to try to heal itself. Does the soul override the will of the body? I can't answer that question. Therefore, I remain unattached to the outcome. If Nanny or Kat is done with her Earthly mission and wish to depart, it is their choice, not mine. Of course I would miss them. I am close to both of them, but I would not blame them or be angry if they chose to leave. My choice is to be as supportive and loving as possible while attending to their needs in the interim. Hear an interview with the author as she is interviewed by Nic Daniel about her spiritually transforming experiences and her near-death experience. Have you ever heard of a soul exchange or a walk-in or walk out experience? I've not only heard of it, I've experienced it twice. My body was a host to the soul that incarnated here in 1959, but in 1999, a new soul walked in when the first soul walked out. It was a mutual agreement, a contract made before birth, but many changes transpired during the transition. In fact, it was life-changing in ways that seemed tragic at the time. The second event occurred in 2005 when I had colon surgery. I knew ahead of time what was going to happen, and I allowed the exchange even though I felt grief for the ones I was leaving behind. Not many changes were noticed in the second exchange; it was a very peaceful experience. In fact, I never even had pain after the surgery! People were amazed. If you would like to know more about this, I encourage you to listen to the upcoming interview with Ray Brennen and Masameh Fritz as we discuss soul exchanges and walk-in experiences next Friday, December 5. Subscribe to RSS feed so you don't miss the show! Ghosts are believed to be the spirit or soul of a dead person on earth. Supernatural, on the other hand, refers to forces and phenomena which are beyond ordinary scientific understanding. Both are closely related to concepts in religion, spirituality and metaphysics. The term supernatural is often used as a substitute for paranormal, and some of typical supernatural experiences are sightings of angels, healings and communications with the dead. To read more click here http://tinyurl.com/6y8bqf. Throughout history, angels have been known as guiding spirits. They have been called "Messengers of God." Angels have been seen as encouraging souls whose purpose is to lead us through transformative events in our lives. Often, these guiding spirits are embraced so that a sense of comfort can be felt in the midst of despair. A dying patient and family members who believe in the presence of angels report feeling blessed by God. To read more click here http://tinyurl.com/6rhgcl. Meaning affects everything we do; and equally important it affects the body as attested to by the many examples of body-mind relationships, such as the placebo effect. Finding meaning in death is not always easy, and sometimes it is hard to find. To read more click here http://tinyurl.com/5bylo5. The Afterlife - Science or Fiction? One of the disadvantages our human race has, is, that no one really knows what will happen to us after we die. This is the main factor why we live in this troublesome world where ignorance, wars and famine are widespread. Other civilizations on distant planets may have the knowledge of what the afterlife has to offer. Therefore, they do not require any machines to survive their tranquil life span and so they do not need to seek communications with other planets as we do. It is certain however, that our human body is built up of countless atoms, like any other matter. According to scientific textbooks, there is more space in an atom than there is matter. In each atom, there are several subatomic particles, such as protons, neutrons, electrons and many others. All these are ‘semi-physical’ particles. To read more click here http://tinyurl.com/653psw. Life after death. There would hardly be a human being who has ever lived that hasn't wondered about the possibility. Indeed there are many people who believe that they have lived past lives. Those who have had what are commonly referred to as NDE's (Near Death Experiences) tell all sorts of stories about being attracted to "white light" and being "beckoned into the afterlife" by long dead relatives and friends. To read more click here http://tinyurl.com/5qn6ng. Does Science Support the Afterlife? Is death a myth? Of those who believe in an afterlife, about half believe in reincarnation, while the remainder believe in a shift to another place such as heaven. Both are included in The Tibetan Book of the Dead, which teaches that a given soul or spirit can achieve different states after death, and only one involves reincarnation. In a similar manner, Hinduism teaches of two possible paths to take after death: one to the gods and one to the earth. Our consciousness is spiritualizing the material dimension through our expanded thought patterns. What would like be like if we stopped judging people and started asking what piece of the puzzle they have? What is their vision? What can I learn from them? Read the rest of the article here http://tinyurl.com/6e9v34. African Shaman Tommy Mueller says they are confused souls who did not resolve their emotions before death, or for some reason didn’t fully cross over. This may happen when death occurs suddenly as in the case of a traumatic experience such as murder, suicide or a vehicle crash. Many times these souls do not realize that they are dead and will attempt to interact with their living loved ones. This reminded me of Patrick Swayze’s character in the movie Ghost when he tried, as a spirit, to get his girlfriend’s, (played by Demi Moore), attention. Personally, I have had my own ghost experience; like the time I put the scissors on the table, walked across the room to get something then walked back and the scissors were gone! I looked all over the house, and finally gave up on finding them. When I walked back to the table a little while later, I found them exactly where I left them. I thought I was crazy or going blind. Sooner or later these departed spirits will move on—probably to another incarnation where they progress at a higher vibration or level of awareness. It is not uncommon for ghosts to hang out in the auric field of a person who vibrates at a high level or has a lot of light emanating from them. They may influence a person’s life in a negative way. Focused energy work or verbal command will remove the spirits and send them on their way. Remember the stories of how Jesus verbally cast demons out of people? These may have been confused souls who were looking for the light. Why do humans believe in a dark power such as the devil? That may be a true statement considering that the word “devil” is referred to by the ancients as ego, free will or choice. The ancients did not personify or assign deity status to the terms “god” and “devil." They were symbols which represented choice or free will. Without the ability to choose, we have no power at all! Evil or devil is simply a shadow side of ourselves that we have been taught to hide because we consider certain behaviors or character traits unacceptable. The Bible teaches that there is no condemnation in Christ and that we should not judge, yet we spend a lot of time and energy trying to repress or get rid of something that is a vital part of us. Humans assign value to things, situations and one another by passing judgment or rendering an opinion. For example, our society believes it is wrong to be angry and that crying is a sign of weakness; yet psychologists have shown that repressing our emotions is dangerous and causes depression and other mental illness. We can find ways to express our frustration and allow our shadow side to have a voice without harming ourselves or others. I suppose it is harmless to conclude that the vastness of “God” or Divine Infinite Intelligence contains both light and dark. You certainly can’t have shadows without light. Everything in the Universe is a manifestation of God in some way. Even the most negative energy is able to teach us a lesson. People like Adolph Hitler had purpose in life; they just operated totally out of their ego or dark side rather than from their spirit or light side. Sylvia Browne in her book, Past Lives, Future Healing, says there are dark entities or spirits who are estranged from God’s unconditional love and are remorseless, manipulative, often charming and seductive. They are completely without conscious and attempt to draw people away from God by destroying their faith, self-respect, and peace of mind. They have no angel or spirit guide to direct them on their life’s journey, and have no desire to progress spiritually. They do not go to a place of joy when they die; instead, they go to a hollow, bottomless void called the Left Door and return to earth in utero. They continue this cycle for centuries until a rescuer from the Other Side embraces them and brings them into God’s light. Note that they do not have a “between” life time and therefore are not the ghosts or apparitions many people see. According to South African Shaman, Tommy Mueller, most souls attend their own funerals, and that spirit guides converse with one another at these events. He says to never go to the funeral of someone you don’t like and pretend to be paying homage to them. The deceased spirit is very likely to be hanging out with the family during the “laying in state” and memorial services. Spirits can read the inner thoughts of every person regardless of the behavior they put on for the family. The deceased spirit is agitated and sometimes angered by the two-faced behavior of those they thought were their friends. Yes, spirits still have emotions! Spirits waiting on the other side for the soul who just passed are also in attendance at funerals and ceremonies, and they rejoice that the soul has been freed from the limitations of the human body. They see life as simply a lesson learned and a contribution to humanity and the planet, but they do not mourn; only humans mourn. Contrary to popular opinion and the vision of the movie industry, spirits do not generally hang out in graveyards. They want to be around people, and funerals are an ideal gathering place for them. They are able to interact with human beings and may choose to visit their loved ones. This does not mean that they are anchored to the earth plane. Without a dense body they are free to be in more than one place at a time. A dishonest visitor stole the ring off a corpse on the “showroom floor” (the funeral home). The daughter of the deceased was very upset and told a friend about it. The friend recommended a visit to Tommy Mueller. During the reading a spirit guide who had witnessed the crime gave an exact description of the thief—someone who had been in attendance the day the ring was stolen. Mueller says that the personality of a soul continues in the afterlife. Otherwise you wouldn’t be you! Jesus Christ appeared to his friends after his death and resurrection in a new type of spiritual body. Many people recognized him not only by his physical appearance but by his character and personality. They didn’t recognize him until he broke the bread in the same manner as he did before his death. (Luke 24:28-31). Both before and after his death Jesus showed frustration that his disciples didn’t believe the truths he had revealed to them. This seems to indicate that whatever beliefs a person holds in consciousness at the time of death will continue to exist until they are resolved and the soul moves on to another plane or mission. The “Tibetan Book of the Dead” describes an intermediate state called “bardo” which an individual enters after death. The Sanskrit word “bardo” refers to the 49-day period between death and rebirth during which a soul is adjusting or acclimating. This is the time that one is most likely to encounter deceased loved ones. That causes me to wonder whether there are stages to entering the Afterlife similar to the way a soul comes in gradually as a fetus developing in a mother’s womb. Perhaps “bardo” is the “Valley of the Shadow of Death” mentioned in Psalms 23 of the Bible. Almost everyone I interviewed for this book told me that they sensed the presence of their loved ones near them during the funeral, graveside ceremony and in the days following. A friend of mine had a similar experience. Anita Cooper said that when she and her husband, Eldon, were going to the hospital for his cancer surgery, she saw someone approaching the side of their car. She thought it was a neighbor trying to catch them before they pulled out of the garage. She turned and saw the spirit of a man in her back seat. “We’ve got company,” she said to her husband. She began a conversation with the spirit, and he told her his name was John and that he was Eldon's brother. He said he wanted to be with him during his surgery if the “others” would let him stay. She thought it was strange that the man claimed to be Eldon’s brother because Eldon was an only child and he didn't know who John was. Much later, Anita asked Eldon's mother if she had another child. She said that she had lost a male child in a miscarriage and that his name was John. She had never conceived again, and Eldon never had children of his own. Therefore, John did not find a body in which to be near Eldon. Instead he was with him in spirit. Eldon then remembered the invisible playmate he had as a young boy and knew that it must have been John. In 1996 my former husband, Bill, and I were living in Tucson, Arizona. We were good friends with John Payne and his wife, Sharon. Bill and John were in grad school together working on their Master of Fine Arts in creative writing. John and Sharon went through an ugly divorce and John was just returning to normal after grieving deeply. We probably saw John at least once a week and talked to him frequently. He was quite the character—big energy, deep voice—and he came from a blue-collar mid-western background. He loved to shock people and say what everyone else was afraid to verbalize. He didn't care what anyone thought of him and seemed rather gruff on the exterior but was really a big teddy bear. He was a gifted poet, and his writing spoke of the inner emotional world. That seemed odd coming out of this big, macho guy. We had talked to John just before Halloween when he left to go rock climbing in the Dragoon Mountains at Cochise Stronghold. We got a phone call that he had fallen to his death, and when we learned that his body was being sent back to Illinois, we decided to have a memorial for him in Tucson. Our service was attended by John's Arizona friends and people from the creative writing program at the University of Arizona. In Mexico there is a Mexican tradition to honor deceased ancestors called Dia de los Muertos, or Day of the Dead. The Mexican Catholics have kept a lot of the pagan traditions; which I love. It was my visit to Mexico that sparked my interest in Paganism. I especially like the way they depict the Virgin de Guadalupe alone, not just as Jesus’ mother, and standing on the crescent moon! Anyway, on the Day of the Dead, the Mexicans build an altar and place candles and photos of their deceased loved ones on it. Plates of food and wine are left out for the spirits of the dead to come and feast. The Pagans believe that the veil between the physical and spiritual planes are thinnest around Hallowmas or Halloween time. Dia de los Muertos is on Nov. 2nd. During that time, it is believed that we can communicate best with the Other Side. In keeping with the Mexican tradition we made a huge Dia de los Muertos altar for John. We created an outdoor show of his poetry, which we mounted with photos and hung from trees. At the memorial, we allowed people to walk around and read the poems John had written. Then we came together to tell stories about him and share our feelings. We all spoke of how John lived and loved with wild abandon. Everything he did was with extreme passion and he died the same way. Legend has it that the Native American, Cochise’s body was never found and was believed to still be somewhere in the Dragoons. We imagined John and Cochise hanging out together. We thought we felt his presence in the room, and knew he was getting a kick out of the whole thing. To us it was so much better than a funeral or formal religious memorial. I had no idea how much John’s sudden death would effect me on a spiritual level. I had just begun to explore my spiritual path. The following spring I quit my full time job as Program Coordinator for a human services organization. I had the opportunity to take some time off and really think about my life. John was a powerful teacher. Looking back, it was his death that ignited something inside me that sent me on a deeper search. It initiated a whole string of events that led me to my current path as a healer and spiritual seeker. From 1997-2000, I went through an intense period of spiritual growth that I think of as a shamanic death and rebirth. It is nice to remember John and the beginnings of my spiritual journey. and it often comes with bitter agony. that you will ever feel better. You are sure to be happy again. will make you less miserable now. Light on the Water is an Near-death experience support and interest group for people who've had related experiences, researchers, caregivers, seekers, media and more. Since Samhain or Halloween is coming soon, I thought it would be nice to offer something for those who have loved ones on the other side. The veil between the physical and non-physical worlds is thought to be very thin this time of year and many of us allow the spirit of our deceased loved ones to join us for the evening. It’s like a family reunion of departed souls. Think of some way you can honor your deceased loved ones this week. Maybe light a candle and send them love and light, or create a list of things you love about the person, or set a plate at the table one night at dinner to show that you have not forgotten them. There are times when a person has an out-of-body or near-death experience and doesn’t talk about it until later. October 21, 1976 was a beautiful fall day as my friend, my brother and I rode home from school together. We were hungry and after browsing the pantry for snacks, my brother decided to cook French fries while Kathy and I played duets on the piano. We settled down to munch out and were engrossed in the TV when we smelled smoke. I ran to the kitchen and noticed the electric eye of the range was still on high and the pan was smoking badly. I turned off the burner and without thinking I picked up the heavy pan to remove it from the heat. As I did, the grease ignited and flames whooshed up the cabinets and flashed toward me, singeing my hair and face. I panicked and lost all common sense. I foolishly picked up the skillet of flaming grease and started walking slowly across the kitchen toward the back door. My hand literally caught on fire, so I set the pan down to extinguish my skin. The table cloth caught fire so I picked up the skillet again and threw it through the screen door. As the pan left my hands, grease and flames scattered everywhere and I fell into a slippery puddle of what I thought would be my death. The tablecloth was on fire, Kathy’s coat hanging on the back of the dining chair was engulfed in flames and I lay on the floor kicking helplessly trying to stand or crawl out of the circle of death. I saw my life flash before me and even read my obituary in the Atlanta Journal-Constitution. My spirit was outside my body, even though I was aware of what was happening to me. It was like being in two places at once. Although I knew I had been burned, I felt no pain. Not knowing whether I would live, I was totally unafraid of dying. I was in total peace when Kathy pulled me out of the flames. As my spirit came back into my body, the pain hit me with a horrible jolt. I knew I was seriously burned. My brother was unable to reach our mother at work so he ran across the street to get a neighbor. The neighbor called the fire department, and rushed me to the emergency room in her car. The pain was so excruciating that I begged God to let me go back to that etheric state where I did not feel my body. All I could do was groan and suffer as the pain of third degree burns overwhelmed me. Some fundamental Christians believe that an “unsaved” soul will go to hell when the body dies. Since a person’s consciousness and karma remains after death, hell could be considered the state of mind we create for ourselves while on earth. African Shaman, Tommy Mueller says that karma can be worked out in the Afterlife. I suppose that is why some people are concerned about a judgment of souls after death. In every NDE I’ve researched where the individual experienced any type of judgment, it was the higher consciousness of that person judging themselves. It was more of a life review to reveal areas that needed improvement. To me, this would be a helpful evaluation, not something to be dreaded or feared. In fact, it is somewhat common for us to assess our decisions and actions to determine whether they are helpful or harmful to our soul’s development. For some people this is a daily exercise. For others, it is practiced at least once a year when they make New Year’s resolutions. We come to this planet with amnesia about our soul’s identity and live behind a veil in order to function as a human being. The brain does not consciously remember where the soul came from, but it seems as though a part of the soul remains on the other side and is able to subconsciously participate in both worlds simultaneously; whether through dreams, meditation, hypnosis, inner guidance, or psychic abilities. Suppose you are alone and sense the presence of someone else in the room. Could it be a deceased loved one? Yvonne Perry has revealed the grave truth about death, dying and Afterlife in her new book, More Than Meets the Eye. She has collected true stories from people across the country who have either died and come back to tell about it, or who have communicated with loved ones on the Other Side. These stories reveal why we should not be afraid of dying and how to actually look forward to the Afterlife. Perry addresses the known and the unknown fears about death and offers insight to help a soul prepare for transition. Perry has had a few “close calls” of her own. She shares her near-death experiences and tells about her frequent communication with deceased loved ones, angels and spirit guides. “Crossing over and communicating with the spirit realm doesn’t have to be frightening,” says Perry. Interviews with experts such as multiple near-death experiencer Rev. Juliet Nightingale, African Shaman Tommy Mueller, and Aaron Milstone, M.D. at Vanderbilt University, lend credibility and intrigue to this non-religious but very sound presentation for proof of an Afterlife. Perry has been intrigued by the mystery of crossing over since she was a small child when she questioned, "If Heaven is so wonderful, why are people so sad when someone dies and goes there?" The curiosity continues, not just for Perry, but for more and more people who are interested in books about death, spirit, and angels. Perry, now 49, address topics that many people are not comfortable talking about—such as suicide, the near-death experience, end of life decisions, the experience of grief and other emotions regarding the passing of a loved one. Her chapter on euthanasia comes straight from her own experience with her beloved uncle who was kept alive on machines against his will for almost a year. In the chapter entitled, “Let Go of my Toe” she gives a heart-rending account of her uncle’s plight and his spirit visits to her in his final days. Imagine her surprise when a year after his death she encountered his spirit at a 7-11 store smoking a cigarette and drinking Coke! Perry addresses the touchy subject of suicide head on and shares some alternative viewpoints. For those who enjoy the TV show, CSI, Perry offers surprisingly true but graphic information about postmortem procedures and choices about body disposal. Regardless of religious background, the reader may find comfort in knowing that this life on Earth is not all there is—that there truly is more than meets the eye! Yvonne Perry is a freelance writer and public speaker, who has authored and published several books on spiritual and scientific topics. She is a graduate of American Institute of Holistic Theology where she earned a Bachelor of Science in Metaphysics. 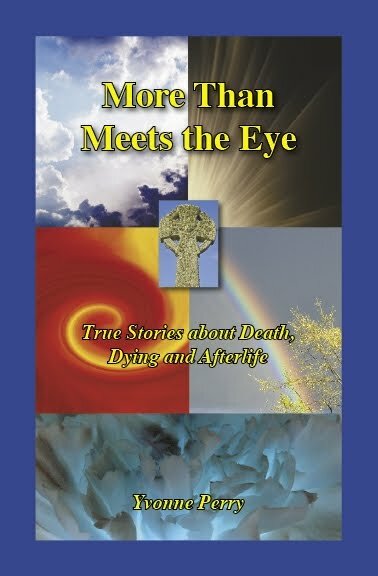 Carol Denbow will interview Yvonne Perry about her book More Than Meets the Eye, which covers many aspects of the dying and grieving process and sheds light on near-death experience, suicide, euthanasia, and spirit visits after the passing of a loved one. By clicking the links below, you may hear Carol Denbow as she interviews Yvonne Perry about her book More Than Meets the Eye. More Than Meets the Eye, True Stories about Death, Dying, and Afterlife, is available for free as a PDF for anyone who subscribes to the free newsletter at writersinthesky.com. The author will mail you a brand new signed paperback copy for $10 plus shipping if you contact her. Dinged copies that have a little wear on the cover are $5 plus shipping. After having a near-death experience (NDE), many people report that their fear of death is gone. That was certainly true for me after being so close to death during the fire. In fact, there have been numerous times since then when I have wanted to leave my body and go Home. That doesn’t mean that I wouldn’t react with panic if someone grabbed me in a dark parking lot and shoved a gun in my face. It means that when I think about dying, I have no worry about what is to come. If we really believe that what exists on the other side is peace, joy, a reuniting with loved ones, and the absence of distress of any kind, we would not fear death. Near-death experiences give us insight on the Afterlife. Those who have visited the “Other Side” have amazing and comforting stories about what they experienced. I was nineteen and living in a cheap walk-up apartment I had rented with my 18-year-old girlfriend. We thought the place was a mansion. The two of us had just graduated from Business School and landed a job. I invited my 12-year-old sister to spend the weekend with us. We were sitting around the table laughing and acting as silly as teenagers and a twelve-year-old can, when I got very tickled and the fish I was chewing got sucked down my windpipe. I tried to stay calm. I got up and walked around trying to get my breath. When I couldn't, I panicked and began running frantically around the apartment in a wild and crazy last claw for life. I knew beyond a shadow of a doubt I was going to die...and ...I did! I traveled very swiftly down a black tunnel and toward a small round dot of light. I was totally unafraid to go to that light. The round circle got larger and larger and larger and just as I began to enter, a figure came between me and the light. I knew him! I knew him! I perceived that he was Jesus. He turned me back toward my body on earth. Meanwhile my roommate was trying to call an ambulance and my baby sister had tackled me. She got me into a sitting position on the floor pressing my midriff hard onto my knees, forcing the fish to dislodge. I could finally get a breath. When I became aware of what was going on in the room, my roommate was still thumbing through the phone book to call someone. I told her I could breathe and to not call anyone. That night I cried and cried and cried and couldn't tell anyone what I was feeling. I could not go to work for a few days because my lungs, my sinuses, my nostrils, my muscles and everything else hurt so badly from my struggle to breathe. The awesome experience of seeing something I could not explain or understand was more overwhelming than the fact that I almost choked to death. I had never heard anyone speak of any of these things so I kept it locked away in my heart like a precious secret. Thirty years later my sister and I were discussing the incident and I left out the part about going down a tunnel to the light and seeing Jesus. Then I asked her, "How did you know what to do? The Heimlich maneuver was not even invented then and you did a rendition of that move." She replied, "A voice told me what to do." That’s when I told her the rest of my story. My sister became a nurse and I believe she was called to the occupation when, as a twelve-year-old, she saved my life. However, I floundered around until I finally found MY true calling—one that has taken me on a wonderful path to spirituality. This is a compelling question that plagues everyone throughout ones life. Juliet Nightingale has been on multiple deathbeds and have actually died a few times—having flatlined and lost all vital signs—commonly known as a near-death experience (NDE). In her article, she shares what one goes through as one dies, and everything involved with the dying process, from an experiencer’s perspective. This information differs widely from what one learned in medical or nursing school, because it comes from one who’s actually been there. It is about the reality of death, and will remove the air of mystery behind the dying process. Hopefully, this will also help change people’s perspective about the individual who is dying and what he or she is actually going through. Many children who are too young to know the difference between earth reality and other dimensions also report having out-of-body and near-death experiences. Many well-meaning parents who are afraid of the paranormal may discourage or even punish their children for speaking of such things. Some children who have had an NDE end up with IQs that exceed 180! Medical science, which attempts to separate the physical body from its spiritual counterpart, tends to rationalize and invalidate these experiences. However, those who have had a near brush with death, come back with a better understanding or appreciation of life. The consistent message of NDE accounts is that God loves us unconditionally. Many report life-changing and long-lasting effects from their encounter with this unconditional love—some seem to exude or embody this love. Some NDEs are not pleasant or comforting. Some are downright frightening and negative. However, each person’s brush with death is unique and includes what they were ready to see and hear. By coming back to us, they become great teachers who want to share what they have learned. Researchers are finding that supernatural knowledge may be obtained through near-death experiences. Before his NDE in 1995 Mark Wray had little knowledge or background in physics or science; however, when he returned from the brink of death he possessed incredible knowledge about the law of octaves, plasma technology, the structure of harmonics, the table of elements, thermal technology, the string theory and other scientific/mathematical theories that are now being released and discussed by physicists and quantum mathematicians in scientific forums. During his encounter he was taken on a guided tour to the sixth dimension—the outer edge or threshold of the veil of creation. There he was shown how the acceleration of the frequency of tones becomes viewable as a color of light on a quantum octave level. If the frequency continues to accelerate beyond the cosmic ray, there exists a vibratory rate that is known as human thought. Mark’s theory brings a new understanding of the New Testament book of Revelation. The book is not a prophecy of gloom and doom that many religions have made it out to be. The revelation has to do with quantum physics, the chakra system, the twelve steps in the chromatic scale and 144,000 tones or colors and the acceleration of consciousness in crystalline form. During his NDE, Mark was given a choice. He could stay in the sixth dimension and continue his soul’s evolution or he could come back to earth and help others with the knowledge he had obtained. No matter what his choice, he would be loved unconditionally. There would be no condemnation or judgment if he decided to stay. Mark did NOT want to return to the body, but he felt that the greatest good of humanity could be served if he did. He made his choice and is still looking for ways to share, explain and incorporate the supernatural knowledge he gained. The first seven years back were hell for Mark and changed him forever. The way he understood relationships after the event completely changed his family dynamics. His wife no longer recognized him as the man she had married. Mark wanted to move forward spiritually, but his wife wanted him to be the same person he was before the experience. This incompatibility resulted in divorce. Mark says that humans make things unnecessarily complicated. He is learning to keep life simple by not resisting the experiences that come his way, but rather to just go with the flow. He reminds himself constantly that he must be patient and allow individuals to each find their own path back to Source. In our modern age of medical technology many people, who would have died, have literally been brought back from the brink of death. Some have been revived even with no pulse or heartbeat. Some were pronounced dead for hours. In years past, people were discouraged from talking about such phenomenon and those who did were considered crazy or mentally ill. Some even ended up in institutions where they were given shock treatments. But, times are changing. One dove told me that I couldn’t have mine yet. “You have to wait a while,” he said, “You need to go back and finish raising your children.” I was disappointed. I didn’t want to go back. I wanted to join the people with the white robes. I came back but I had no desire to be here and didn’t want to live. It took a while for me to adjust to being here again. I knew there was a better place waiting for me on the other side. An experience like that never leaves you, and I have never been afraid of dying since then. As with Jackie, many people who have near death experiences say that they did not want to come back. Many spoke telepathically with heavenly guides and understood that their journey on earth was not finished—that they had work left to do for the growth of their own soul and for other people. So they came back willingly, though often reluctantly. During a close brush with death people report seeing angels, former pets and deceased loved ones. Many times near-death experiencers return with their lifelong beliefs and their outlook on life radically changed. Want to talk with others about your spiritual experience? Want to talk with others about your spiritual experience? Have you been visited by the spirit of deceased loved ones? Do you have a hospice story? An unusual experience at a funeral or wake? Click the link below that reads "post a comment" and type in your story. Or you may contact the author to share your experience. The author will add your story as an entry on this blog. Coming Soon--an interview with hospice volunteer Carol Denbow and the author of More Than Meets the Eye Yvonne Perry. This will be posted on Friday, October 24, so be sure to bookmark this page and come back. Or you may sign up for the RSS feed to get an email notification whenever new material is posted to this blog. See a video about a parent's wish for old age and dying. Considering the subject of your book and the wonderful things you have included...giving many people hope and a new perspective on their own belief system....I'm seeing for you ...wearing the "White Collar" , so to speak. Yes, people are going to want to talk to you about things they haven't been able to discuss with anyone! — A.K. Your book makes it clear that you know how to provide that comfort and to help people not be afraid for loved ones who have passed. —A.G. Have started reading your book--loving it. Yours is the next step after Betty Jean Eadie's "Embraced by the Light." The world is ready for your book, now. —J. M.
I read your book and thoroughly enjoyed it. Your book will be a tremendous success and will be a transition handbook that everyone will want to own. I have always been fascinated with NDE's and as an avid reader can't get enough of it. — L.T. Finished reading your book yesterday! Enjoyed it very much – I feel that I’m beginning to understand a lot more now. Thanks so much! —M. P.
It was nice to talk with you at the meeting on Monday. I am fascinated with your book. —M. L.
I just now finished listening to your program! …it was wonderful -- even made me cry! Of course, this stuff is so close to my heart and it means so much to me that more and more material is getting out there for people to see/hear. —J.N. Thanks for sending More Than Meets the Eye. I received it yesterday and finished reading your work this morning. Interesting book. As one who had a NDE as a teenager and other spiritual happenings, later in life, many of the experiences you write about were similar to my own, which gives me great comfort knowing I am not alone in these experiences. —C.B.